"Vinyl Record" by Normadeane Armstrong Ph.D, A.N.P. 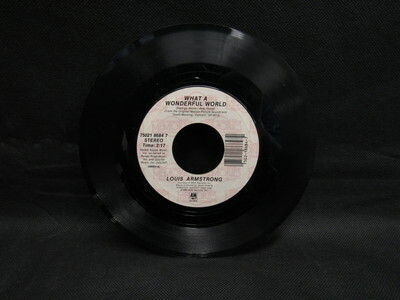 This is a Vinyl, 7", 45 RPM record featuring "What a Wonderful World" by Louis Armstrong and "I Got You (I Feel Good)" by James Brown. This record was produced by A & M Records and the songs featured were used in the motion picture "Good Morning, Vietnam." The barcode on the record reads 7502-18684-7.